What did you do you this weekend? Leicester Underwater Exploration Club (LUEC) was formed in 1958 by a small group of enthusiastic people who had discovered the new sport of scuba diving and wanted to pursue the sport within a club environment. Over the years the membership has changed somewhat but we retain some very long standing members. One of our earliest members was a director of the Midland Diving Co. Ltd. since renamed Midland Diving Equipment. The Club remained independent at first, until eventually in 1967 it joined the British Sub-Aqua Club (BSAC) and became branch number 0321. Around this time underwater films were beginning to be shown on TV and this caused an upsurge in interest - which boosted membership to around 120! Membership stayed around this mark rising to around 150 in 1976 where it stayed until the mid-1990's. During the first years of diving the Club based its activities around the available inland waters and once a year organised a group holiday to the coast. In 1965 the Club purchased its first rigid inflatable boat (RIB) and engine and named her 'Anne Oxia'. Sea dives became increasingly popular and as a result a few years later the Club brought a second boat and engine and christened her 'Hy Poxia'. In 1968, a Club member was involved in the rescue of a female diver at Stoney Cove who had got herself in trouble. The member was credited as saving her life and as a result, her grateful parents (particularly her father who was a doctor), in his appreciation, presented the Club with a cheque for £120. This money was used towards the purchase of a Minute Man resuscitator. Over time more and more sea dives were being organised as well as foreign holidays and diving weekends during the summers. As a result the RIB engines began to wear out. In 1974 Anne Oxia was looking worse for wear and was sold to a Club member for their own private use; using proceeds from the sale and Club savings a new inflatable was purchased and named 'Anne Oxia II'. In 1974, after many meetings with the Sports Council, LUEC was granted £600 towards the cost of a portable compressor to enable its members to dive away from the much used coastal resorts where such facilities were available for divers. The club added £220 to the fund and the compressor was officially presented in April 1974. In May 1984 the Club purchased a van to transport scuba equipment and the compressor to dive sites and in 1988 two new rigid hull inflatables were bought from Northern Dive with engines from the RNLI. In 1992 one of the boats, unfortunately, was stolen and replaced with a 5.5m Delta RIB. Up until 1987 the Club’s indoor training had taken place at St Margarets Baths in Leicester. When the centre temporarily closed for refurbishment new facilities were found for the Club at the nearby Aylestone Leisure Centre until works were completed the following year. LUEC remained at St Margarets until its close and subsequent demolition in 2001 when eventually training was transferred back to the Council ran Aylestone Leisure Centre - where we still remain to this day. LUEC was honoured to win the BSAC Heinke trophy in 2005 in recognition of the significant contribution the Club and our members made to the growth and development of scuba diving. In 2018, LUEC celebrated its Diamond (60th) anniversary. A party was held in its honour at Stoney Cove with members old and new celebrating its achievements over the years. Throughout the anniversary year, monthly social events were organised to enable members of all ages to share dive experiences and memories, and more importantly enable newer members to get to know each other. Social activities included dinners out, ten-pin bowling, country walks and barbeques. The focus for LUEC’s 61st year is however, to get back to the Club’s original roots and increase the volume of water based activities undertaken, as such a wide ranging calendar of dive trips has been planned for the year. LUEC’s 25th Anniversary in 1983. 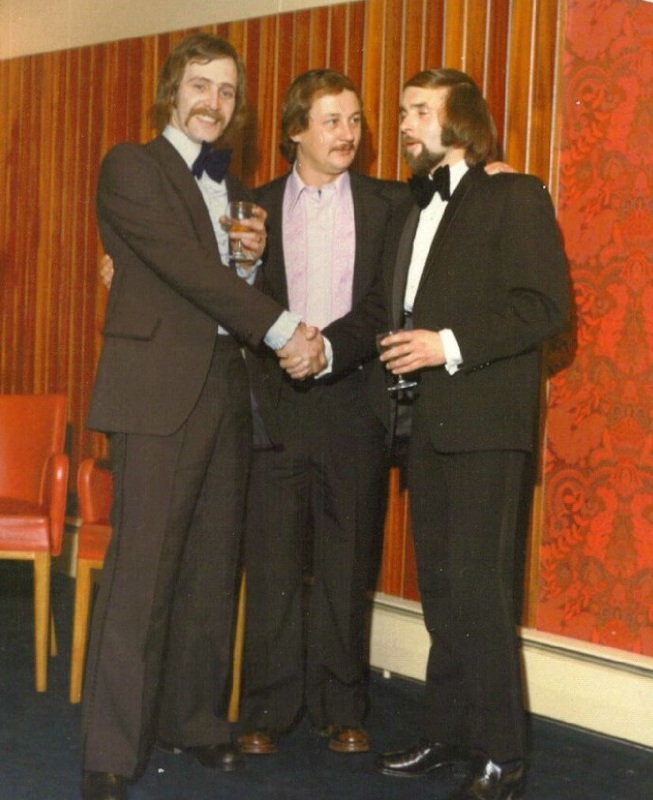 Check out the moustaches!